In 2003, Ron Westad spoke about his personal values and beliefs. “It wasn’t a matter of how much could we make or how much could we charge members.” | Arizona Federal Credit Union has a new $3 Monthly Membership Fee! Greedy fatcat managers are forcing members to pay a mandatory $3 ripoff fee every month, simply for being a member. That's not mutually beneficial. ← The banks listened to their customers and dropped the outrageous fees. When will Arizona Federal Credit Union get smart and listen to its members? 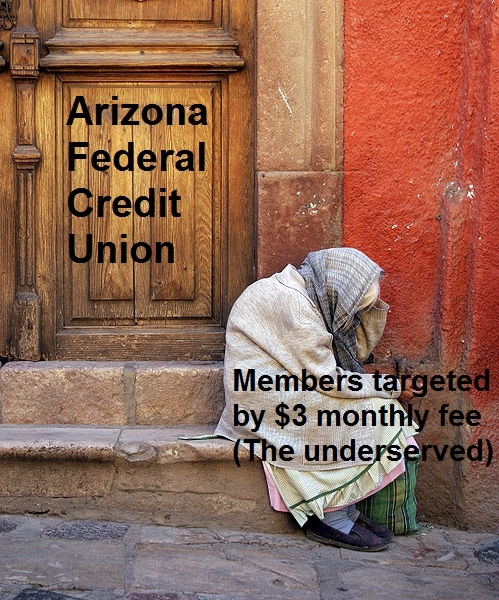 Arizona FCU doesn’t want the poor members. How is that sustainable for the community? In 2003, 10 years before the unavoidable $3 monthly weasel fee took effect, Ron Westad spoke about his personal values and beliefs. When did Mr. Ronald Westad lose his personal values and beliefs to cause him to decide to begin charging the needless $3 monthly, $36 yearly weasel fees? What happened to Arizona Federal providing low cost services to its members? How can the poor and underserved afford $36 in annual fees? What happened to your commitment to the underserved? This entry was posted in principles, values, listening to members, Ronald L. Westad, underserved and tagged $3, Arizona, arizonas, bank, banking, beliefs, ceo, contact, credit, due, dues, FEDERAL, fee, fees, GPUL, greater, Internet, league, member, members, monthly, owner, personal, Phoenix, poor, president, ron, ronald, service, underserved, union, unions, urban, values, westad, young. Bookmark the permalink.